"The Noctilucas are amazing tonight! Take this mask and snorkel and go there now! ", Luis told me. During my surf and work road trip in Uruguay, I decided to stop by Cabo Polonio, a place many people told me was really special. I arrive there at the end of the day and discover that there is no car access as it is a protected reserve. I have to take a "bus" to go there which has a Jurassic Park feel: it is a 4 wheel drive giant truck with metallic reinforcement all around it able to carry roughly 20 persons. It is the last truck of the day, and we're just 3, sitting on the top of the driver's cabin. The truck enters the reserve and dives into the night. I start to understand why we need such a vehicle - the path, going over endless dunes, is extremely rough. Even if we go just a bit faster than a walking man, I feel like I am in a washing machine. There is no light except the ones of the truck and the wonderful canopy of the stars. It seems like years that I did not see them shining so brightly. We finally reach a large beach and start rolling at a faster pace. In front of us, we start to see a light-house and all around it, diffuse and yellowish lights. When we finally arrive to our destination, I realize that the houses there are only lit with candle light. It is midnight and I still have no clue where I am going to sleep tonight. So I start my quest to find a hostel with availability. On the way I meet a group of Argentinians who are super friendly like every Argentinian I have met during my round-the-world trip. I finally arrive to the Viejo Lobo Hostel, and one of the owners, Luis, tells me, "Yes there is a place for you here!" "The Noctilucas are amazing tonight! Take this mask and snorkel and go there now!" I quickly drop my bag and surfboard and go on the beach which is just behind the hostel. 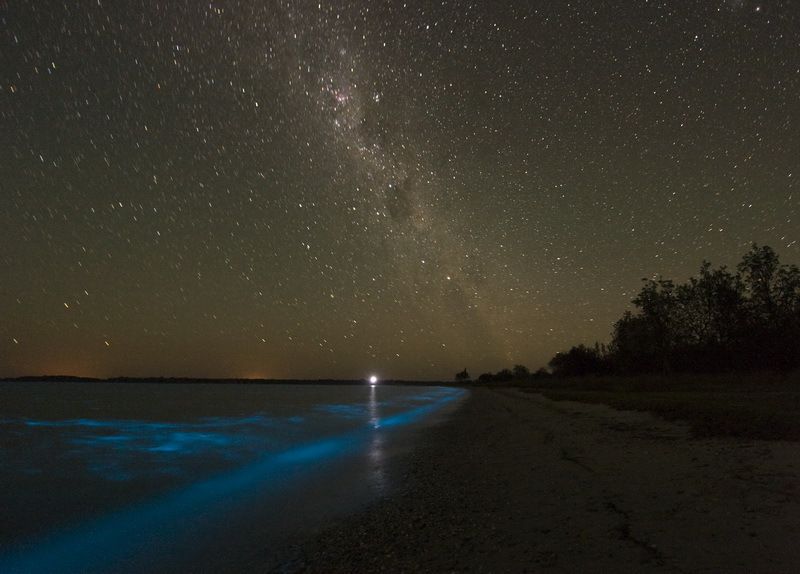 When I finally get into the sea, the Noctilucas, a luminescent plankton, start lighting up everywhere! 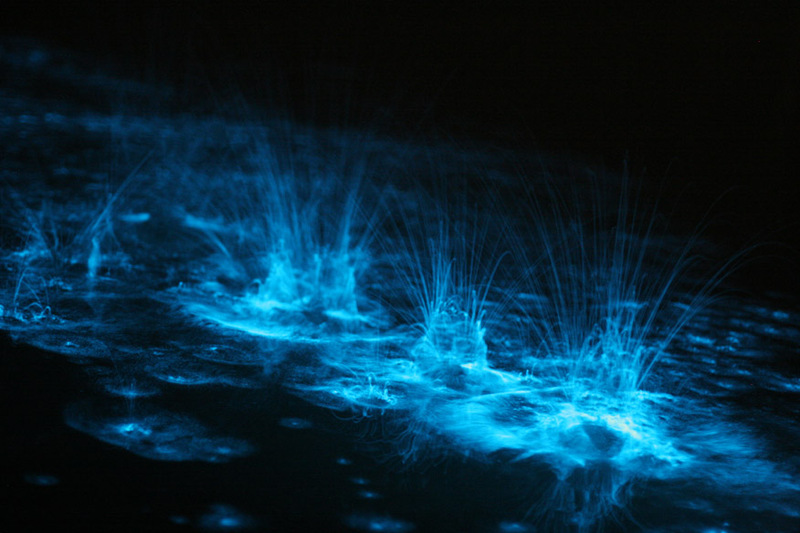 I stir the water around me with my hands and the lights get brighter, creating glowing circles. I feel like a magician with supernatural powers. I then put the mask on and start swimming in the water. And what I see there is fantastic. When I swim, my fingers, hands and arms start to glow. 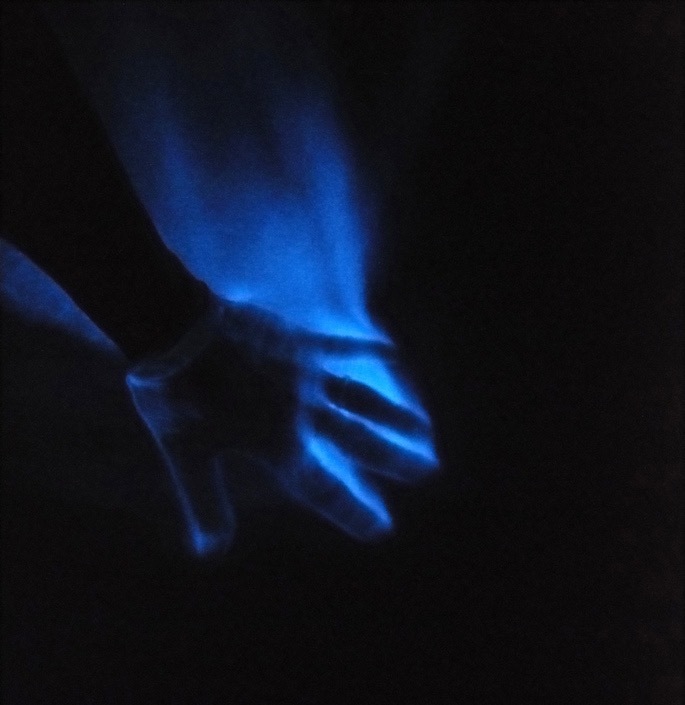 The Noctilucas, which reacts to movement, are creating a luminescent skin all around my body, covering my hands like luminescent gloves, my face passing through its luminescent drag. I feel like superman on fire! When I raise my head over the water I start to see Noctilucas also in the sky. What is that ? It is actually the stars which glow with pride in the deep night. I feel like I am floating in space, with stars all around me. Or are they Noctilucas? Words are not enough to describe what I am feeling. I am so excited that I shout with happiness. 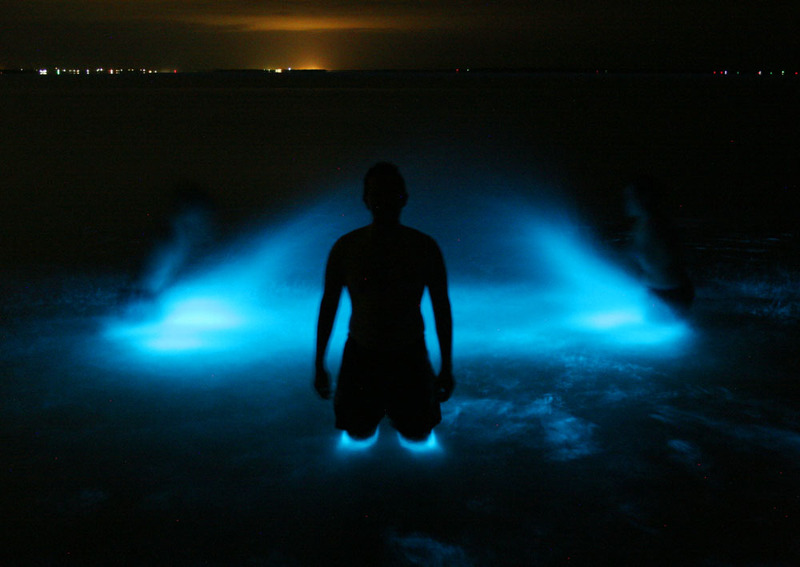 A group passing by stops and joins me in the water, and we start playing with the luminescent water together like children. I feel so good. I'm truly alive. I have no fear of anything. These are just the first few hours that I experienced in this amazing place called Cabo Polonio. I am Raphaël Harmel, a digital entrepreneur, traveler, yogi and surf addict from France. I am the organizer of "The Yoga Summit", the biggest online event about yoga.